From Fochriw flying site continue with the site on your right until you reach a junction. Turn right and immediately right onto A4255 towards Bedlinog, follow past the cemetery until you reach a right turn. Car park on your right. Please park in the car park, lat/long above. The best directions for this hill are WSW-SW and NNE-NE. No taking off at the trig point for powered aircraft. Land anywhere, however not in the valley between Bedlinog and Merthyr to the west. This is not the best of flying sites, but is good for ground handling as the area is wide open with gentle slopes all round. The SW and NE slopes are steeper but do not have a great height difference. The hill can be used as a top up for XC from Merthyr direction. The area is open grazing land, covered in grass with few exposed rocks and gullies. There is a real problem with fly tipping and hypodermic needles have been found in the area of the car park. Livestock graze the land and wild horses roam freely. The NE slope does have issues with the local grazier from the farm to the NE, however he does not have any legal ownership of the land. A recognised Paramotor Take-off and Landing area (see paramotoring noted below). This is commonly used take-off for paramotoring. Great trips include: to the Brecon Beacons, along the mountain railway, to Pontsticill reservoir to the north or a visit to the Pit Pony (great to see from the sky) to the south. Park in the car park and take off on the flat area just in front (it slopes slightly downhill to the south). Do not drive onto the grass. 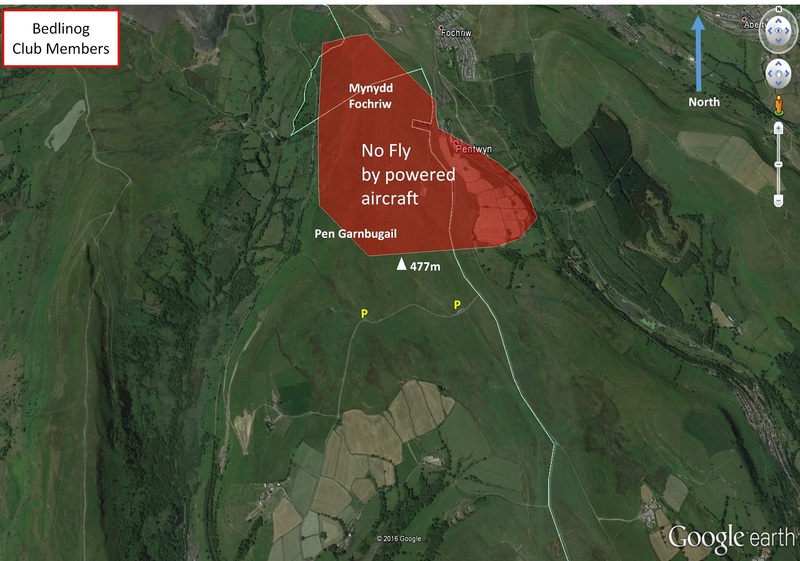 Take off is possible in most directions, but if it is a northerly (the take-off is slightly up hill) or easterly (take-off limited by boggy overgrown ground), you are much better off moving to Gelligaer Common. If it has been raining Gelligaer common may be a better bet too. It is common to find sheep and horses on the top. They tend to move away once the motor starts up, but be careful. If it’s your first time here, you should familiarise yourself with where any rocks are. Expect many passersby to get out and video you on their phone – if you would prefer to avoid this then go to Gelligaer Common where you can be more out of sight. Do not overfly the farm to the east of Bedlinog. Do not use the trig point as a launch point. Do not fly low over urban areas. Not known if any XC flights have left from here but can be used as a top up if at height. Bedlinog Common, 2.2km NNW of Bedlinog village.